The German Mannshaft’s done it. The FIFA World Cup 2014 goes to Germany again – the first time since 1990 and German reunification. The country’s ecstatic and so is its flag carrier. To commemorate the victory, the first time a European team wins the cup on South American soil, Lufthansa sent its latest B747-8 Jumbo Jet to Rio de Janeiro to collect the German team and their friends and family and fly them back to Berlin where a massive street parade continues to be under way ever since the deciding goal fell late Sunday night. The 362-seat B747-8 sports stickers saying “Siegerflieger,” or “the victors’ airplane”, in addition to having its corporate ID cleverly altered from Lufthansa to “Fanhansa”. 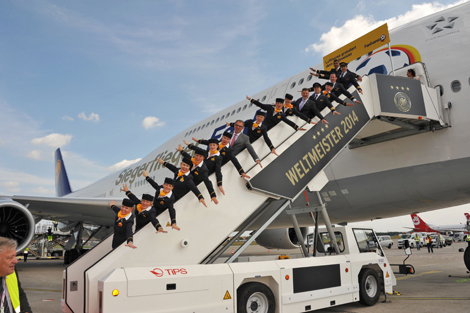 To capture the momentum Lufthansa also adorns a handful of other aircraft with the “Fanhansa” livery. Before departure from Rio, German striker Lukas Podolski tweeted a photo of himself in the cockpit wearing the captain’s hat and his World Cup credentials, as well as the jersey of Flamengo, one of the most popular Brazilian soccer clubs. “Welcome on board! On the way to Berlin! See you tomorrow, fans! Greetings from the Siegerflieger. Your Poldi,” said the text, using the player’s nickname. 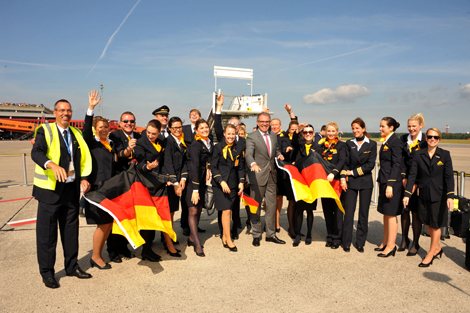 Good for Germany and good on Lufthansa, we think. Now how about some football-inspired menus for the remainder of the summer?